The Hunger Games: Mockingjay – Part 1 starring Jennifer Lawrence, Julianne Moore, Philip Seymour Hoffman, Liam Hemsworth, Woody Harrelson, Josh Hutcherson, and Donald Sutherland. If Jennifer Lawrence is in it, it’s going to be a good movie, or so we have come to expect. Mockingjay-Part 1 is no exception. Fans of the Hunger Games series will flock to this movie and will love how it sets the series up for the big finale that will come in Mockingjay-Part 2, to be released next year. Part 1 sets the stage for the revolution that will come at the hands of the Districts as they unite in their fight against the Panem Capitol. 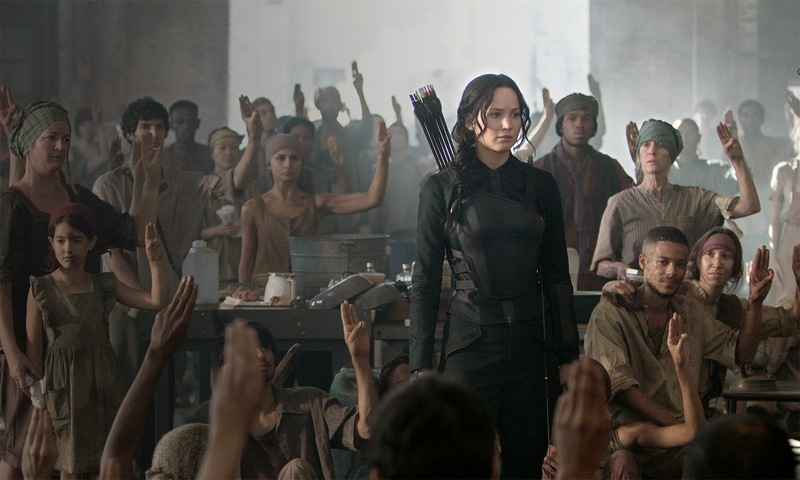 Katniss Everdeen (Jennifer Lawrence) has unwillingly become the symbol of the revolution after the last Games and is now trying to cope with her new life in District 13. Using her status as the symbol of hope and strength, she does everything she can in order to get Peeta (Josh Hutcherson) rescued from the clutches of the Capitol and the evil President Snow (Donald Sutherland). Based on the three books written by Suzanne Collins, the Hunger Games series has so far given the audience exactly what it wants. Although Mockingjay-Part 1 doesn’t quite live up to the excitement and action in The Hunger Games and Catching Fire, it is still necessary to complete the series and show more of Katniss’ inner struggle and her relationships with Gale, her sister, and Coin, the President of District 13. Without all of the inner dialogue that plays a prominent feature in the book, it would be very possible for Katniss to appear as a very one-dimensional character on screen; but with Jennifer Lawrence playing the part, that never becomes an issue. She has a unique ability to touch the audience and make them feel something. There are some very exciting moments in the movie but the parts that really get you are the scenes where Katniss’ passion leaps across the screen and tugs at your own emotions as a viewer. It is very fortunate that such a talented actress has been involved with the series since the beginning, or it could have easily turned into an empty saga with atrocious acting like Twilight. Other solid, seasoned solid actors that help round out the film and give the newer characters depth are Julianne Moore and Philip Seymour Hoffman (“Plutarch Heavensbee” previously appeared in Catching Fire and is Philip Seymour Hoffman’s final role before his unfortunate death). This is a series that must be watched in a sequence and Mockingjay-Part 1 will mean absolutely nothing to those who haven’t seen the first two movies. For those who have read the books, the suspense of not knowing at which point the movie will end is part of the fun, and knowing what is going to happen in Part 2 will also add to the excitement. Overall, Part 1 is both a solid adaptation of the book and a good prelude to what is surely going to be the most exciting and the most emotional film in the series.